Using native warm season grasses for biomass production is a broad and multi-faceted topic, and can leave you with a number of questions. Here, we share some of the more common ones we’ve addressed during our years of experience. And for those questions that need more assistance, please contact our Customer Service Team. Switchgrass is a tall-growing, perennial, warm season grass that is native to much of the U.S. Switchgrass was widespread in open areas before settlers populated an area, and remained in one place year after year. What soil conditions does switchgrass need to do well? 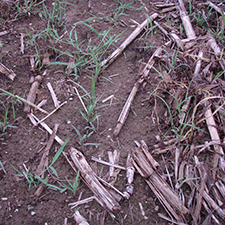 Switchgrass is adapted to a wide range of soil types and conditions. Better soil may result in higher biomass yields, but switchgrass can make marginal lands productive. When do I plant switchgrass? There are a number of approaches to planting switchgrass. Depending on the situation, one may be more appropriate than another. For our production, we normally plant from mid-May through mid-July. Switchgrass can be planted in a variety of ways, including hand broadcast, machine broadcast, and no till. The condition of the ground being planted determines how much and what kind of work is needed prior to planting. Regardless of the tillage method used, the goal is to provide a seedbed that will allow good seed-to-soil contact, which is essential for the seed to germinate. It is also important to be conscious of the fact that this new stand may have a life of 15-20 years. Even in no or low tillage methods, care should be taken to smooth out ruts and holes in the field. Also important in the establishment of a switchgrass stand is weed control, especially in the establishment year. This can be controlled through herbicide application, high mowing, or a combination of the two. It has been our experience that better weed control in the establishment year results in a more successful stand establishment. Even the most successful stands will take approximately three years to fully mature in Pennsylvania. Do I have to re-plant switchgrass every year? No. Native, warm season grasses are long-lived perennials which, once established and with proper management, will produce biomass for a period of 15-20 years. What is required to manage an established stand of switchgrass? 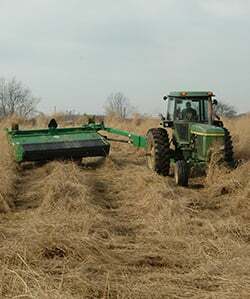 Switchgrass can be managed with a small amount of spraying in the first couple of years, then needs only traditional haying equipment to harvest it each year. As long as the biomass is being harvested, it is not necessary to burn the fields. What is required to harvest switchgrass? 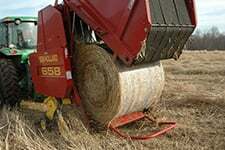 Native, warm season grasses are harvested with traditional haying equipment readily found throughout the country. How does switchgrass affect my soil? Switchgrass has a root system that can grow up to 6’ deep. This root system can break through soil strata, such as plow pan or hardpan, and allows switchgrass to grow in a wide range of conditions. This root penetration also improves the structure of the soil. While switchgrass is a fierce competitor within the stand, it is not invasive in nature. This is due mainly to its fragile establishment phase. There are literally hundreds of other species capable of choking out switchgrass seedlings should they manage to germinate unintentionally. Traditionally speaking, why do people plant switchgrass? For years, switchgrass has been used for game cover, reclamation, and as a buffer zone along streams to keep harmful chemicals and sediments out of our waterways. Why should I plant a crop that takes three years to reach maturity? One of the most exciting characteristics of switchgrass is its potential to turn marginal land into productive land. Most people envision planting switchgrass and other native warm season grasses on marginal or currently unproductive land. Regardless of a market for it, the idea is that it doesn’t replace any current row crop production, but adds to the overall productivity of a farm. Do switchgrass roots cause problems with field tiles? Ernst Conservation Seeds has been growing switchgrass and other warm season grasses for over 30 years. This might be possible; however, in our experience we have never seen this being a problem. How much biomass does switchgrass yield? In the Northeast U.S., it is not uncommon to see yields of 3-6 tons per acre with relatively little inputs. Biomass is “renewable organic materials, such as wood, agricultural crops or wastes, and municipal wastes, especially when used as a source of fuel or energy. Biomass can be burned directly or processed into biofuels, such as ethanol and methane.” -The American Heritage® Science Dictionary. Houghton Mifflin Company. 19 Feb. 2007.